Pick a random NFL fan out of any bar in America and ask him/her who is going to be the Offensive Rookie of the Year (OROY) for the 2018 season, and 90 percent of them will likely say one name— Saquon Barkley. Between the damage he can inflict on defenses on the ground and in the passing game, it is not hard to see Barkley winning it. However, if awards were given to the players everyone thought would win, Dak Prescott and Alvin Kamara wouldn’t have won the last two seasons. Should Barkley live up to his hype, he will be in the conversation for OROY at the end of the season. The Giants already have a strong passing game, and they finally improved the offensive line (well—half of it at least). But there will be other talented players in the conversation along with him. Should they live up to their hype or exceed expectations, they will make the decision a hard one for voters. Dak Prescott may not think that a No. 1 wide receiver is necessary, but it helps to have someone he can fall back on when the game is on the line. With Jason Witten and Dez Bryant gone, he doesn’t have anyone ready to fill that void. Gallup could be that guy. He has the right skillset to succeed in the NFL. Dallas will certainly want to use his speed to force defenses to spread the field. But they’ll also make use of him when they need someone to move the chains, too. Secondaries will likely be focusing more on Allen Hurns when the season starts and will be busy trying to stop Ezekiel Elliot. That could mean looser coverage or single coverage on Gallup—and an opportunity to shine. Guice may not have the sheer power that Samaje Perine has. But he is the more dynamic and elusive runner between the two. When he finds a crease, he’ll make the most of his 4.49 speed to exploit it and shoot downfield. He will likely end up splitting carries with Perine at first. But Perine wasn’t too impressive last season. It may not be too hard to win the role outright with a few good games. If he wants to boost his odds of winning OROY, he needs to learn how to be more of a factor in the passing game (29 total receptions in three seasons at LSU). Freeman will likely start the season splitting carries with Devontae Booker. But if he can outshine Booker early, he’ll end up getting the bulk of the workload. With Denver’s zone blocking scheme, he’ll get a chance to put his vision and cut-back ability to good use. He will not average 5.9 yards a carry as he did in college. But, it is not hard to imagine him doing well right out of the gate. It will certainly help that defenses will be preoccupied with shutting down Case Keenum and the passing game. Penny is already penciled in to be the starter in Seattle. His competition isn’t bad but if they were really any good, the Seahawks wouldn’t have drafted him when they did. His offensive line is expected to be better this season, but it remains to be seen how much better. Luckily, he’s got more than enough speed to make the first guy miss. However, in Seattle, he may have to make a few guys miss if he’s going to get anywhere. 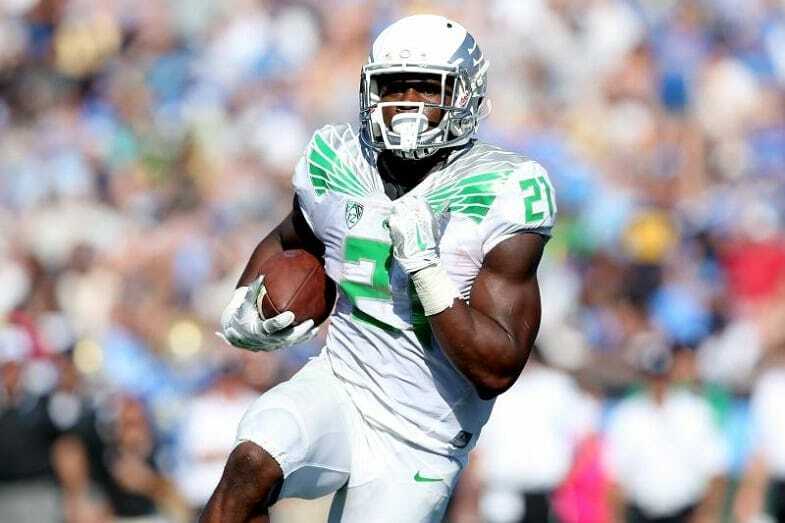 A guy that can average 7.4 yards a carry for two seasons can probably make a few guys miss. He was never a big part of the passing game in college, but if Russell Wilson can get him involved with it in Seattle, he could become one of the favorites for OROY. Michel’s candidacy will bank on the Patriots giving him enough work. New England has a crowded – and young – running back room. But with Dion Lewis gone, they will be looking for someone new to be the primary back. James White is currently penciled in as the lead back followed by Mike Gillislee and Michel. Being the lead back in that offense could be an opportunity for the right running back. 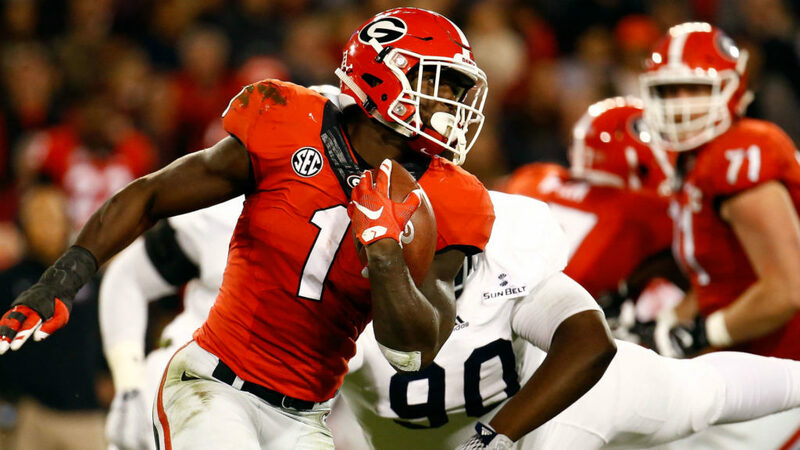 Michel looked like the right running back at Georgia…. Whether you believe Mayfield has a shot at winning depends on if you believe some of the recent reports (that he’s not going to be ready to play this season). If he actually isn’t, then, of course, he can’t win it. But if that guy fans came to know and love in Oklahoma shows up and can establish a connection with Jarvis Landry and Josh Gordon, he’ll be in the conversation at the end of the year. Other guys worth keeping an eye on include: Calvin Ridley, WR, Atlanta Falcons; Christian Kirk, WR, Arizona Cardinals, Josh Allen, QB, Buffalo Bills; Josh Rosen, QB, Arizona Cardinals; Nick Chubb, RB, Cleveland Browns.